UPDATE: A second Dalek in white has been requested by my brother. Might have to do something a bit different since they are two toned: white with bronze dots. Stay tuned. So another friend of mine is pregnant, go figure, and I have yet another something to make. These friends are big into Dr. Who so I thought it would be pretty funny to do something from the show in crochet. Thought about the Tardis but I thought that might be a bit obvious. Then I remembered that a long time ago I had found a Dalek pattern and saved it. Perfect. 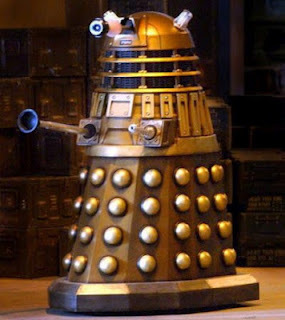 This is the picture of a Dalek that I was working from. It took a bit of work deciphering the blurry screen shot I originally took of the instructions. And only after I was done did I bother to look for a PDF or something. Of course I found one after a bit of digging. So I did that increase for both rows. Only later to realize that row 15 alone creates 48 and after 16 I then had 56... Leading into two rows later having the 63 instead of 54... What so what it really should have said was row 15, do the increase, row 16, one hdc in each to maintain count of 48. So of course I had to rip out four rows of work to get it to match the stitch count. Bottom was a separate piece. The black helped reinforce the seam. The yarn color I used was called Toast. A nice and kind of shiny brown without being too sparkly. I then used some of the leftover silver sparkle from the elephant to make the eye light things on the head and some sort of attachment for the left arm. I used a little black and a double crochet to make the plunger arm part. I also added black embroidering for the vents and panels on the body as well as to make a bottom lip to help it sit upright. Overall, this pattern took about 10 hours, but only because of all the undoing and redoing and the extra embroidery. 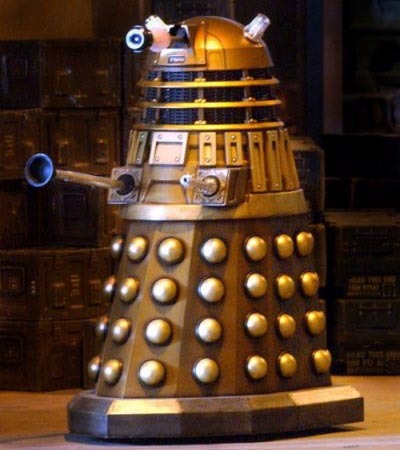 Now the baby Dalek is ready to exterminate anything that might try to harm its new human master.